Nothing says “fall” like a pumpkin. These bright orange gourds are synonymous with fall — and picking your very own from a local pumpkin patch is a requirement! Our Guide to Pumpkin Patches in Dayton will help you pick the picture perfect pumpkin for your porch! Fall is in the air! Let Apple Country provide you with all of your fall fun, including a 9-acre corn maze, hayrides, pumpkin painting, mums, apples, gourds, winter squash, pumpkins, straw bales, corn shocks plus much more! And don’t forget to pick up some local honey, and fresh maple syrup from Holmes County! Bonnybrook Farms is your family’s fun destination. The pumpkin farm is a festival of color and activities. Pick and cut the perfect pumpkin from the Pumpkin Patch; take an Adventure Wagon Ride with professional actors; find your way through the CrAzEd CoRn MAzE; pet and brush friendly Farm Animals and Ride a Pony; play a round of Clodhopper Golf or try your skills at Giant Slingshots and Archery. It’s all family fun! Jump on one of our hay wagons and take a ride to the pumpkin patch to pick that “perfect” pumpkin. Pay for all pumpkins at the main entrance when you exit the farm. Come enjoy a hayride to the pumpkin patch with the family! For the month of October Fulton Farms has all kinds of fun, food and games. we have a corn maze, farm animals, hayrides and lots of great fall food. They have a brand new corn maze for customers this year!! This is an all ages corn maze and not scary, but children must be accompanied by an adult. They have a variety of animals at the farm. If the animals are feeling up to it we will have them outside in the field next to the barn. They have feed for sale for a small fee in the barn at check out. Kleather’s Pumpkin Patch is a family run business and has been up and growing for over 35 years now! They sell an assortment of fall items including pumpkins, gourds, squash, straw bales, fresh apple cider, apples, snacks and many other fall goodies! More than 50 varieties of pumpkins, squash and gourds are grown right here on the farm, from the teenie tiny mini pumpkins to the huge prize winner pumpkins. Some pumpkins are new selections, some pumpkins are distinctly different, grown for fall decorations. Other pumpkins are best for cooking. Pumpkins are available from the display area or can be picked fresh from the field. Finding a perfect pumpkin for your Jack O’ Lantern will be a treat. They have the perfect place for some family fun. McMonigle Farms Pumpkin Fest offers the most affordable and unique pumpkin patch in Middletown, Ohio. Grown right here on our farm. We raise more than 50 different varieties of pumpkins and squash for you to choose. We plant, weed, pamper and baby them along to get the prettiest, most perfect pumpkins possible (say that three times). With so many varieties and sizes of squash and pumpkins you’ll can find the cutest little mini’s right up to the giant Jack O’lantern, just right for carving. $9.00: Children under age 5 free with a paying adult. Children age 12 and under must be accompanied by an adult. Tuken’s specializes in a wide variety of seasonal, freshly harvested fruits and vegetables. Great care is taken to ensure the highest quality and flavor, from selecting the right seeds and preparing organic mulch growing beds, to the on-going care in protecting the plants from damaging insects and diseases. Each vegetable is carefully hand picked and promptly displayed to meet the most discriminating buyer’s need for ultimate freshness and taste. Sizemore Farm is all about family fun! Come and pick your pumpkin in our pumpkin patch, pack your own bag of fresh apples with several varieties to choose from, let the kiddos take a Dragon Wagon Ride around the yard…sample our freshly made Kettle Corn…take a ride on the best Hay-Ride in the State of Ohio… warm or cold we sell award-winning Apple Cider… take a few minutes and look around our antique barn. Get your fall pumpkins and Mums here at Warrick Farm. Several varieties of pumpkins to choose from. Beautiful colors of fall mums ready to fill your flower garden or add to decorations. 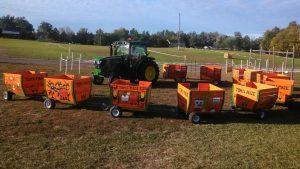 Enjoy the best of Windmill Farm Market’s SPOOKTACULAR fall hayride. Their famous adventure hayride contains all the best parts of autumn. It includes educational information about how pumpkins survive and grow, views of our animals, and much more. The 30 -minute trip takes you up and down hills, through the mud, and back to the pumpkin patch. The hayride trail is decorated for younger children but is sure to be enjoyed by people of all ages! As with any U-Pick farm, we recommend calling before you go to ensure hours and selection. Most farms offer limited activities during the week, and expanded hours and fun on the weekends.